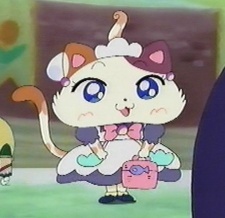 A cat's girl that came to Crayon Kingdom to become Princess Silver's housemaid after the Grim Reaper was sealed. She runs after them because she felt the responsibility that has liberated angels from the clock. Punya is kind, tends to take good care of others, and to be careless.she is weak to cold, and hates earthquakes.